I love having kid’s nite in. I have always been more of a homebody than a party girl, so having little ones to hang with is just my speed. Gather up board games, family inclined video games, or the Legos spread all over the house and plan a family game or built it night. Serve warm gooey cheese with these salty little soft pretzels I found on Deb’s Smitten Kitchen. With small hungry onlookers, I opted to just cut the dough in two-inch sections and make pretzel bites. Such a simple way to add a little pizazz to your standard fondue. 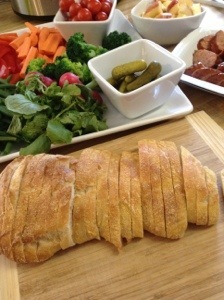 Make it more of a meal by adding sliced smoked sausage or mini cooked meatballs, blanched veggies, and crusty bread. Spend a little time making family goals for the upcoming year, maybe even brainstorm for a wishlist/bucket list. Children and adults alike love bite sized food. Get a little creative, and make some sliders….chicken fried steak on a biscuit, regular hamburger sliders, or sweet & spicy pulled pork are all winners! A Texas spin on a traditional lucky food. Cook peas and set aside. Sauté onion, pepper, and garlic. Add to cooked peas. In a food processor, purée peas, onion, garlic, spices, and lime juice with cream cheese until dip consistency. Fold in green onions and cilantro. Spread in baker, top with grated cheese, and bake at 375 until heated through and cheese is melted. Garnish with sour cream and serve with corn chips.